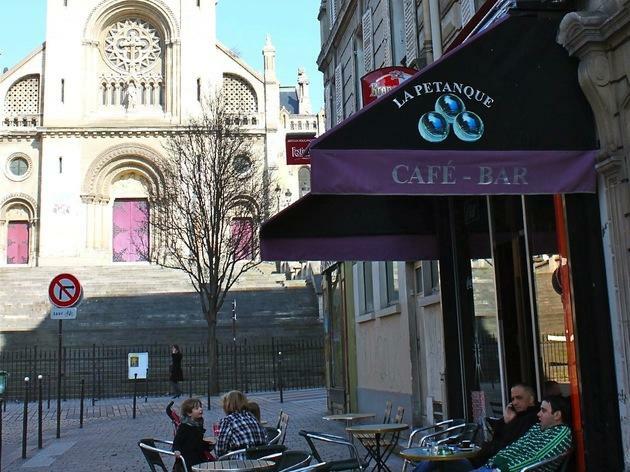 As you come out of Menilmontant metro, you feel overwhelmed by the cars and the proliferation of fast food chains; but don’t despair, two minutes away there’s a charming pedestrianised square planted with trees, which hosts several good bars and restaurants. 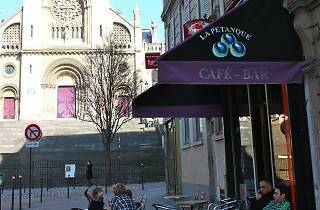 One of these, La Pétanque, has a sunny spot and a bunch of tables at the foot of the grand staircase leading up to the Church of Notre-Dame de la Croix – you almost feel like you’re in a village in the south of France. The old couple who own La Pétanque are delightful, offering lots of draught beer at low prices, and do everything to accommodate as many groups as possible as they fill up the chairs. Great place for enjoying cheap drinks in the summer! The owner goes above and beyond to make you feel welcome and will happily add a chair or two outside if needed. You can also order a pizza (or anything else) nearby and eat it at your table. This is the place to enjoy a chill, no-fuss evening with friends, and although you are in the bustling Menilmontant neighborhood, the square offers a little calm before heading on to one of the clubs nearby!